New York City . The action. The lights. The . . . taxi cabs! It would be practically impossible to picture the city without the tens thousands of cabs that coat its busy streets. 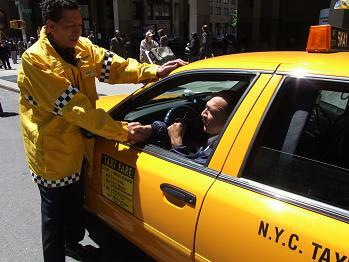 In fact, it is estimated that there are approximately 100,000 taxi cab drivers that earn their living in the city. If you were among those cabbies ten years ago, you not only fought for customers, but most likely, the pang of fear every time you got behind the wheel. It was at that time that cab drivers in the city were being murdered at alarmingly high rates, and considering that cell phones were not then prevalent, cab drivers had scarce means to protect themselves from becoming crime victims. 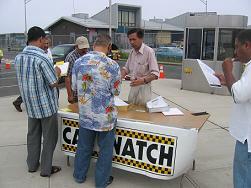 That changed, however, in 1997 when a 50-driver pilot program called Cab Watch was launched. Today, Cab Watch not only serves as an organization that represents 13,000 New York City cab drivers, but also as an additional corps of eyes and ears for the city. To deliver this information, a network of trainers visits the New York City Taxi Academy on a weekly basis, and regularly visits licensing facilities, garages, and areas frequented by cab drivers. In addition, trainers also visit JFK and Laguardia Airports, where numbers of taxi drivers gather in what is known as the Taxi Hold. “The Taxi Hold is a massive parking lot at which drivers gather and receive a number that allows them to pick up passengers departing from the airport,” explained Brouillette. “It's a perfect place to provide training because there are groups of cabbies who will park and wait – sometimes for hours – until their numbers are called.” Brouillette says the full discussion typically lasts for 20 minutes and covers everything from the basics to the benefits. Coupled with this training is a comprehensive tool kit distributed to drivers, which features a section on security procedures that can be used to reduce a cab driver's risk of vulnerability to crime. Tips in this section include knowing the location of police stations, fire houses, and other 24-hour establishments that can be used in case of threatening situations, being sure to appear as a veteran driver rather than an inexperienced one (since criminals tend to target novice drivers), securing cash in places other than a shirt pocket, which provides easy access for thieves, and opening the window just enough to receive cash from a passenger who insists on paying outside of the cab. The section also provides cab drivers with information on what types of crimes warrant a call to 911, and which should be considered non-emergency situations that justify a call to 311, such as noise complaints, open fire hydrants, and stray or sick animals. Additionally, drivers have access to an 866 number that they can use to contact a Cab Watch representative. The three-person staff, along with trainers, also regularly call cab drivers to follow up with them after testing, to find out if they have experienced any troubles, and to identify any needs they may have. Unfortunately, in spite of the training they receive, generally speaking, cab drivers are less likely than most to become involved in an investigation or even leave their name with police if they have witnessed a crime. There is a simple reason for this reluctance: if they are called to be a witness in a trial, they would lose a day – or perhaps more than a day – of work, and for most, the financial hardships that would result would be far too costly. “We are in the process of trying to raise money that will compensate drivers for lost pay due to an appearance in court,” said Brouillette, who admits that this is still a subject that must be addressed. An additional challenge that Brouillette sites is identifying ways to organize the cabbie community. “Because of the nature of the business, a majority of cab drivers remain rather isolated, though we have located some places where they tend to gather,” he explained. Moreover, Brouillette says that while the bulk of drivers who work for the Yellow Cab Company serve the Manhattan area and are somewhat easier to make contact with, those that work with the Livery Taxi Company represent a more difficult population to reach. “In general, many Livery drivers work in communities that have higher crime rates, rarely speak English, and are usually more suspicious of authority, so they are much harder to connect with and organize,” said Brouillette, who hopes that future efforts will be made to develop effective means for reaching and assisting this group. 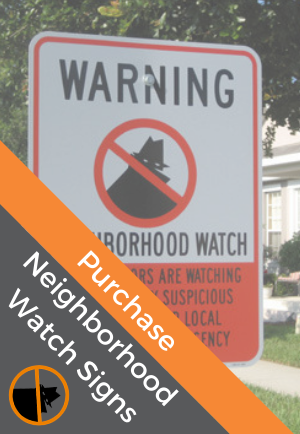 In spite of the challenges that have faced the program, Cab Watch has indeed experienced significant success. In just the past year, for instance, the number of drivers that were contacted through outreach efforts more than doubled, escalating from 1,500 to 3,750. Brouillette credits innovative efforts and persistence for this significant boost. While the program has been run through the Citizens Committee for New York City through funding from the Department of Labor, it is in the process of being transitioned to separate non-profit organization. Brouillette reports that the changeover will be completed by August 1 st .